Look at your hair. No, go on – really look at it. Grab a small handful and squint at it, pick out a few individual strands and really peer down at them. Looking a little bit worse for wear? Don’t worry, it happens to the best of us. Lucky we’ve got this handy guide to finding out just how damaged your hair is – and more importantly, how you can nurse it back to health. 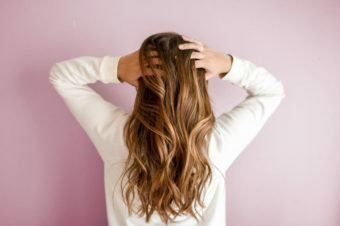 What your hair is like: When you run your hands through your hair, you can feel that the ends are feeling a little bit dry and rough. How it got like this: General wear and tear plays a part – tying it up, taking it down, brushing and even the weather can leave your ends a little parched. Using heat on your hair this can speed up this process. 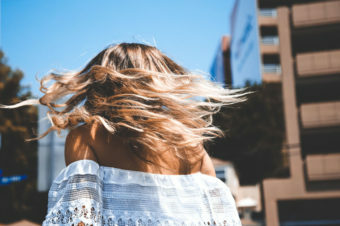 What you can do about it: Try to cut down on the heat, and let your hair air dry sometimes – put it in plaits overnight for beachy waves that are ready by morning. Pick a good conditioner to use on your ends, and let it soak in for a few minutes every time you wash your hair. What your hair is like: Look at the ends – are some of the strands split into two, and feeling really quite dry? Yep, you’re hit stage two. How it got like this: You’ve been at the straighteners, haven’t you? Add some haphazard brushing, putting off booking your trim and you’ve got a recipe for hair that isn’t too happy. What you can do about it: Get into the routine of using a hydrating mask to keep your hair moisturised and prevent further breakage. 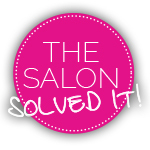 Make sure you schedule regular trips to the salon to keep on top of your ends too. What your hair is like: A lot of your ends are split, some more than once, meaning they fan outwards. Some damage has crept up to the mid lengths of your hair. How it got like this: It’s quite likely your hair is coloured or has been a bit fried by heat, leaving it weakened and prone to splitting. What you can do about it: Swap your usual conditioner for a hydrating mask each time – you should start to notice your hair getting stronger within a week or two. Try to air-dry it as much as possible, get split ends treatment in salon, or use a serum to smooth them at home. What your hair is like: Each strand looks like a tree, split numerous times in numerous places right up the shaft. It’s feeling very dry and frizzy, and you’re struggling to style it. This hair is not happy at all. How it got like this: We’re guessing you’ve been neglecting your hair – the combination of heat, heavy bleaching or colouring and rigorously styling will destroy the cuticles, making it coarse and untameable. What you can do about it: Speak to your hairdresser and see how much they can salvage, before going for the chop – and remember, it will grow back quicker than you think. Then, learn from your mistakes! 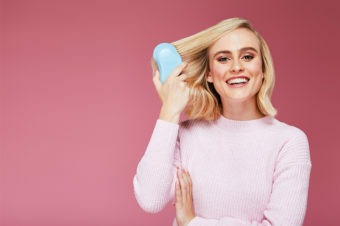 Of course we’re not telling you to ditch the colour or never straightener your hair, but try to avoid heat every other day, and make sure you use plenty of conditioning masks to keep it in tip-top condition.